248 Passengers Were Held Hostage. For the Next Seven Days, The World Was Held Captive. 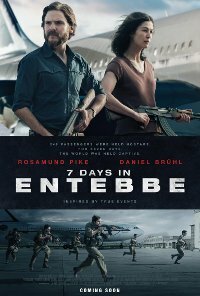 Based on the true story, and using facts previously hidden due to security issues, this film takes a fresh look at the rescue previously covered in 1976’s Raid on Entebbe. 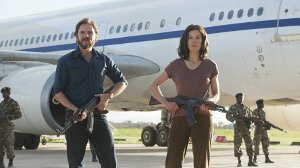 Back in July 1976, an Air France flight from Tel-Aviv to Paris via Athens was hijacked and forced to land in Entebbe, Uganda. The Jewish passengers were separated and held hostage. The kidnappers demanded that Israel release many terrorists held in Israeli prisons. After much debate, the Israeli government sent an elite commando unit to raid the airfield and release the hostages. No persons under 16 (Language, Violence, Prejudice, Drug abuse). Language Moderate impact, infrequent crude language used in anger. Violence Strong impact, frequent violence is present, which includes shooting battles, threats to kill children and hostages, and the killing of soldiers and freedom fighters, with little bloodl-letting. Psychological violence is also present because of the constant life-threatening situations the hostages find themselves in. The violence is sustained throughout the film and would be disturbing to children under 16 years. Prejudice Mild impact, fairly frequent instances fo prejudice are present. The prejudice is against Germans who are seen as and called 'Nazis', discrimination against Jews and freedom fighters who are treated as terrorists.